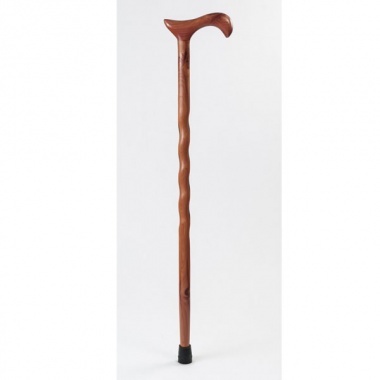 The 34-inch Brazos Derby Twisted Aromatic Cedar Walking Cane is easily one of the most resplendent canes available. Its red and purplish hues swirl beautifully down its shaft, while the Brazos signature twist, with its subtle elegance, accentuates the natural beauty of this unique walking cane. Each derby handle is carefully attached to its shaft using a mortise and tenon joint. The mortise and tenon method is an unparalleled joint method known for its unusual strength; it has been used in wood working for centuries. Like all of the Brazos staffs and canes, the Derby Twisted Aromatic Cedar Walking Cane is handcrafted in the USA using the highest quality wood and time-tested methods. Cane Height: 34 inches.